South Shields is a coastal town at the mouth of the River Tyne, England, about 3.7 miles (6.0 km) downstream from Newcastle upon Tyne. Historically in County Durham, the town has a population of 75,337, the third largest in Tyneside after Newcastle and Gateshead. 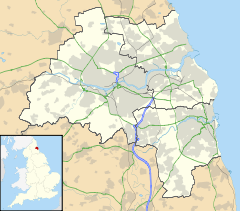 It is part of the metropolitan borough of South Tyneside which includes the towns of Jarrow and Hebburn. South Shields is represented in Parliament by Labour MP Emma Lewell-Buck. The demonym of a person from South Shields is either a Geordie or a Sand dancer. View of King Street, which is South Shields' main shopping thoroughfare. The metro station is located above the street, on the bridge. The first evidence of a settlement within what is now the town of South Shields dates from pre-historic times. Stone Age arrow heads and an Iron Age round house have been discovered on the site of Arbeia Roman Fort. The Roman garrison built a fort here around AD 160 and expanded it around AD 208 to help supply their soldiers along Hadrian's Wall as they campaigned north beyond the Antonine Wall. Divisions living at the fort included Tigris bargemen (from Persia and modern day Iraq), infantry from Iberia and Gaul, and Syrian archers and spearmen. The fort was abandoned as the Roman Empire declined in the 4th century AD. Many ruins still exist today and some structures have been rebuilt as part of a modern museum and popular tourist attraction. There is evidence that the site was used in the early post-Roman period as a British settlement. It is believed it became a royal residence of King Osric of Deira; records show that his son Oswin was born within 'Caer Urfa', by which name the fort is thought to be known after the Romans left. Furthermore, Bede records Oswin giving a parcel of land to St Hilda for the foundation of a monastery here in c.647; the present-day church of St Hilda, by the Market Place, is said to stand on the monastic site. In the 9th century, Scandinavian peoples made Viking raids on monasteries and settlements all along the coast, and later conquered the Anglian Kingdoms of Northumbria, Mercia and East Anglia, who hailed from Angelnen in Denmark (modern day Germany). It is said in local folklore that a Viking ship was wrecked at Herd Sands in South Shields in its attempts to disembark at a cove nearby. Other Viking ships were uncovered in South Shields Denmark Centre and nearby Jarrow. The current town was founded in 1245 and developed as a fishing port. The name South Shields developed from the 'Schele' or 'Shield', which was a small dwelling used by fishermen. Another industry that was introduced, was that of salt-panning, later expanded upon in the 15th century, polluting the air and surrounding land. In 1864, a Tyne Commissioners dredger brought up a nine-pounder breech-loading cannon; more cannonballs have been found in the sands beside the Lawe; these artifacts belonged to the English civil war. At the outbreak of the war in 1642, the North, West and Ireland supported the King; the South East and Presbyterian Scotland supported Parliament. In 1644 Parliament's Scottish Covenanter allies, in a lengthy battle, seized the town and its Royalist fortification, the fortification was close to the site of the original Roman fort. They also seized the town of Newburn. These raids were done to aid their ongoing siege of the heavily fortified Newcastle upon Tyne, and in a bid to control the River Tyne, and the North, and the Shields siege helped cause their battalions to maneuver south to York; this may have also led to a brief winter skirmish on the outskirts of Boldon, though the topography is not favourable for a battle. In the 19th century, coal mining, alkaline production and glass making led to a boom in the town. The population increased from 12,000 in 1801 to 75,000 by the 1860s, bolstered by economic migration from Ireland, Scotland and other parts of England. These industries played a fundamental part in creating wealth both regionally and nationally. In 1832, with the Great Reform Act, South Shields and Gateshead were each given their own Member of Parliament and became boroughs, resulting in taxes being paid to the Government instead of the Bishops of Durham. However, the rapid growth in population brought on by the expansion of industry made sanitation a problem, as evident by Cholera outbreaks and the building of the now-listed Cleadon Water Tower to combat the problem. In the 1850s 'The Tyne Improvement Commission' began to develop the river, dredging it to make it deeper and building the large, impressive North and South Piers to help prevent silt build up within the channel. Shipbuilding (along with coal mining), previously a monopoly of the Freemen of Newcastle, became another prominent industry in the town, with John Readhead & Sons Shipyard the largest. South Shields is situated in a peninsula setting, 247 miles north-northwest of London, where the River Tyne meets the North Sea. It has six miles of coastline and three miles of river frontage, dominated by the massive North and South Piers at the mouth of the Tyne. These are best viewed from the Lawe Top, which also houses two replicas of cannon captured from the Russians during the Crimean War (the originals having been melted during World War II). The town slopes gently from Cleadon Hills down to the river. Cleadon Hills are made conspicuous by the Victorian Cleadon Water Tower and pumping station (opened in 1860 to improve sanitation) and a now derelict windmill, both of which are listed and can be seen from many miles away and also out at sea. South Shields boasts extensive beaches, sand dunes and coves, as well as dramatic Magnesian Limestone cliffs with grassy areas above known as The Leas, which cover three miles of the coastline and are a National Trust protected area. Marsden Bay, with its famous Marsden Rock and historic Grotto public house and restaurant set in the cliffs, is home to one of the largest seabird colonies in Britain. One of the most historic parts of the town is the quaint and beautiful Westoe village, which consists of a quiet street of 1st grade and 2nd grade Georgian and Victorian houses, many of which had been built by business leaders from the coal and shipping industries in the town. Given its beautiful setting, parks and trees, this street was often the setting for a number of books by the novelist Catherine Cookson. Westoe village was once a separate village about a mile from South Shields, but urban sprawl has now consumed it, along with the village of Harton to the south on the main route towards Cleadon and Sunderland. Before 1820, South Shields was a predominantly sparse hamlet and village based rural economy with some small-scale shipbuilding, glass making and salt processing along the riverside. Beyond 1820 and into the Industrial Revolution, South Shields expanded into an urban settlement built around shipbuilding and coal mining. Migration came from up the River Tyne, with other migrants from rural County Durham, Northumberland, Scotland and Ireland. The majority of the people living in South Shields are descendants of those who migrated and settled in the area during the Industrial Revolution in order to work in expanding coalmines and shipyards. Towards the end of the 19th century, with the British Navy needing seamen, Yemeni British sailors settled in the town, this resulted in the first roots of the Yemeni British community in the town. In South Shields, 6.7% of the population are from an ethnic minority (non white British), compared with 5.0% in the surrounding borough of South Tyneside. Most of the Asians in South Shields are Bangladeshi, with the Beacon and Bents ward that covers South Shields town centre, had 9.9% of the population registering as that ethnicity. The Bangladeshi community is the third largest in Tyne and Wear, after Newcastle upon Tyne and Sunderland with 1.7% of the town's population being Bangladeshi or 1300 people. Nearly all of the ethnic minority population in South Tyneside is concentrated in South Shields town centre and suburban areas immediately to the south such as Rekendyke and Westoe. There are hardly any in Jarrow, Hebburn which are the other two major areas in the borough. The population of the South Tyneside Metropolitan borough had decreased from 152,785 in 2001, to 148,127 in 2011. In 2001, the population of South Shields was 82,854. Population data from the 2011 United Kingdom Census return classifies South Shields as a medium-sized coastal town. South Shields has been home to a Yemeni British community since the 1890s. The main reason for the Yemeni arrival was the supply of seamen, such as engine room firemen, to British merchant vessels. Similar communities were founded in Hull, Liverpool and Cardiff. In 1909, the first Arab Seamen's Boarding House opened in the Holborn riverside district of the town. At the time of the First World War there was a shortage of crews due to the demands of the fighting and many Yemenis were recruited to serve on British ships at the port of Aden, then under British protection. At the end of the war, the Yemeni population of South Shields had swelled to well over 3,000. Shields lost one of the largest proportions of Merchant Navy sailors. Approximately 1 in 4 of these men was of Yemeni background. Disputes over jobs led to race riots – also called the Arab Riots – in 1919 and 1930. However, over time, attitudes to Yemenis in the town were softened and there was no significant recurrence of this violence. After World War II, the Yemeni population declined, partly due to migrations to other industrial areas such as Birmingham, Liverpool and Sheffield. However, the main reason for the reduction in numbers was the end of the shipping industry and the need for sailors as coal burning ships decreased in numbers. Today, the Yemeni population of South Shields numbers around 1,000. Many Yemeni sailors married local women and became integrated with the wider community, resulting with a migrant population less distinct than in other mixed communities across the UK. The Yemeni are the first, settled Muslim community in Britain and have been used to justify multi-culturalism. There is a mosque at Laygate, including the Yemeni School, which was visited by American boxer Muhammad Ali in 1977. He had his marriage blessed at the Al-Azhar Mosque, the first purpose-built in the UK. This story is covered in a documentary film, The King of South Shields. Throughout April and early May 2008, the BALTIC Arts Centre in Gateshead chronicled the Yemeni community of South Shields, including interviews with the last remaining survivors of the first Yemeni generation. The exhibition depicted the Yemeni story as an example of early successful multi-cultural integration in Britain, as well as showcasing the high-profile 1977 visit by Muhammad Ali. In 2005 the Customs House commissioned author Peter Mortimer to write a play on the subject of the 1930 Yemeni Riot. The resultant play RIOT was staged at the venue in 2005 and 2008. In 2008, South Shields resident and filmmaker Tina Gharavi unveiled plans for a plaque to mark Ali's visit. In 2008, a critically acclaimed exhibition about the South Shields Yemeni community was held entitled The Last of the Dictionary Men – Stories from South Shields’ Yemeni Sailors, was held at the Baltic Centre for Contemporary Art, Gateshead. In 2009, the detective series George Gently, based on the novels by Alan Hunter, portrayed the Yemeni integration in a 1960s setting. The Bangladeshi community is actually larger than the Yemeni community however Yemenis have been in the South Shields a lot longer. The Bangladeshi community is the third largest in North East of England. The last shipbuilder, John Readhead & Sons, closed in 1984 and the last pit, Westoe Colliery, in 1993. Today, the town relies largely on service industries, whilst many residents commute to work in nearby Newcastle, Gateshead, North Tyneside and Sunderland. Despite a skilled local workforce, for many years South Tyneside had the highest unemployment rate in mainland Britain, although between December 2002 and December 2008 unemployment in South Shields fell by 17.8%, and that of South Tyneside by 17.7%, the best performance in the North East region over that time period. The Port of Tyne is one of the UK's most important and is further developing its freight and passenger activities. In 2007, it imported two million tonnes of coal. Manufacturing and ship repair/engineering are other significant sectors. South Shields benefits from significant public and private sector investment. More recently this has included primarily the town centre, riverside and foreshore areas, given the decline of once-traditional heavy industries with the town's growing importance as a major commercial centre and tourist destination. As well as being the oldest and largest town in South Tyneside, South Shields is also one of the region's most popular seaside resorts. The area markets itself as "Catherine Cookson Country", which attracts many visitors. Further improvements and developments to the seafront are planned. The combined Jubilee Clocktower and Wouldhave Memorial, which stands on Pier Parade alongside "Tyne", Britain's second-oldest preserved lifeboat. a newly refurbished multi-purpose family friendly complex at the seafront, including a bowling alley, a soft play area, a fully licensed bar, Italian restaurant, an arcade called Dunes Adventure Island and a renowned Amphitheatre. South Shields is also home of the oldest provincial newspaper in the UK, the Shields Gazette. Work on the North and South Tyne Piers was begun in 1854 by the newly-formed Tyne Improvement Commission, for the protection of shipping entering and leaving the river. The principal architect and engineer was James Walker, until his death in 1862 (whereupon John F. Ure took over). Construction was delayed by storm damage in 1862, which led to parts of the foundations having to be rebuilt. The South Pier was finished in 1895 and its lighthouse was operational that same year. The pier is 5,150 ft (1,570 m) long (accessible from South Shields seafront, it is open to the public except in bad weather). The lighthouse displays an occulting sector light with white, red and green sectors. The green sector is used to indicate safe waters near the coast to the north of Tynemouth, while red indicates an area with numerous wrecks to the east and south of the lighthouse. It was originally intended that the North (Tynemouth) Pier and lighthouse would mirror their South Shields counterparts, but a series of breaches and collapses meant that the North Pier was completed much later and to a different design. There is a third lighthouse, just upstream of the pier, on the Herd Groyne at South Shields (which was constructed in 1861–67 to preserve Littlehaven Beach, then known as Herd Sands, which had begun to be washed away by the change of currents caused by the new piers). This very unusual lighthouse resembling a 1940s sci-fi movie space craft was built by Newcastle-upon-Tyne Trinity House in 1882 (ownership was passed to the Tyne Improvement Commission the following year). It consists of an upper hexagonal part (including the lantern) of wood and corrugated iron construction, sitting on twelve cylindrical steel legs. The whole structure is painted red and stands 49 ft (15 m) in height. The Groyne shows an occulting light which marks a safe entrance course between the piers, showing white to a vessel approaching from seaward on the correct course, green to a vessel off-course to the north, and red to one off-course to the south. The Herd Groyne lighthouse was refurbished and repainted in 2014, and still acts as a navigational aid to ships entering the River Tyne. A prominent landmark is the Edwardian Town Hall, built 1905–1910, a sumptuous building "the most convincing expression in the county of Edwardian prosperity". The architect was E. E. Fetch of London. Ornamentation includes several references to the town's nautical heritage: Britannia and other sculpted figures in the pediment above the front entrance, a figure of Mercury atop a globe on the dome of the Council chamber, fountains and nymph lampholders in the forecourt alongside a statue of Queen Victoria. The 145-foot clock tower contains a Potts chiming clock and five bells, and is topped by a weathervane in the shape of a galleon. The Old Town Hall, a handsome square building of 1768, provides the centrepiece of the Market Place and closes the vista along King Street. The ground floor is open with arches on each side (and a central pillar which predates the rest of the structure); the enclosed first floor has pitched roof, topped by a wooden bell turret. Originally built and used by the Dean and Chapter of Durham, it was sold by them to the town Corporation in 1855. There is a good choice of restaurants, cafes, public houses and nightlife as well as hotels, guest houses and caravan parks. South Shields plays host to an annual free summer festival and each autumn the town is the seaside finish to the world-famous Great North Run. South Shields is also home to Colmans, established in 1926, which is a multi-award-winning seafood restaurant and takeaway. South Shields has also become the home of the South Tyneside Magic Festival, an annual event created by Martin Duffy, and supported by the local council, The Custom House Theatre, the local magic shop Magic Box, and numerous local and national independent investors. The festival was started in 2004 incorporates magic in the community – magicians perform in schools, libraries and aged persons homes during the week as well as public gala shows at the Customs House. The culmination of the week is the Magic Convention – 3 days of lectures and shows by the world's best magicians. South Shields is home to South Tyneside College, one of the two leading maritime training centres in the UK, with facilities including a marine safety training centre and a simulated ship's bridge for the training of deck officers. The college was also home to the only planetarium in the region, and to an observatory; and in its time was a popular visitor attraction for local schools and visitors in general. The observatory was used for 20 years and in 2008 it was deemed redundant to the future curriculum needs of the college. The domed room that housed the planetarium is now a mosque. The college provides a wide range of other flexible vocational and training courses. Local schooling is generally regarded as being very good, which is reflected in continuing improvements to school results and independent inspections. In 2007, Brinkburn Comprehensive and King George V Comprehensive merged forming South Shields Community School. The new school was built at a cost of £19 million on the King George V School site and was opened in September 2011. St Mary's C of E Primary School was a Christian voluntary aided school educating children aged 3–11 located in South Shields. The school was founded in 1867 to provide education for the children of the labouring and manufacturing and poorer classes, with regard to the principles of the established church of the same name which was affiliated with the school. This school closed July 2008. Demolition of the school began early October 2016 and was finalised late November 2016. The 1998 sculpture Spirit of South Shields, by Irene Brown, embodies the town's maritime heritage. It overlooks the mouth of the Tyne. People born in South Shields are considered to be Geordies, a term commonly associated with all residents of Tyneside. A less commonly used colloquial term is Sandancer. It is presumed to originate from the town's beach and history. (1892–1915) John Simpson Kirkpatrick: lost son of the Gallipoli campaign in World War I, seen with his donkey; Ocean Road, South Shields, Sculpted by Robert Olley, the statue was unveiled in 1988 by the Mayor, Councillor Albert Tate. Phil Brown – former manager of Preston North End F.C. Christie Elliott, professional footballer for Partick Thistle. Robert Olley – artist and sculptor, creator of the painting "The Westoe Netty"
Gary Young – screenwriter and director of Harry Brown. South Shields F.C. is the town's main football team. Originally formed during the first decade of the 20th century, the team played in the Football League during the 1920s. In 2014, the club played in the semi-professional Northern League Division Two. The side currently play in the Evo-Stik Northern Premier League after winning promotion in 2018. South Shields is the home of two rugby clubs, South Shields RFC and Westoe RFC. South Shields RFC have been playing at Grosvenor Road, South Tyneside College since they were formed in 1956. Westoe RFC, formed in 1875, still play at their original ground, Wood Terrace. In 2005 they had an Intermediate Cup run and got to Twickenham but were beaten by Morley R.F.C. from Yorkshire. South Shields is a safe Labour Party Parliamentary seat, the only constituency in existence since the Great Reform Act of 1832 never to have elected a Conservative MP. It is currently held by Emma Lewell-Buck who won the seat in a by-election held on 3 May 2013 which had been triggered by the retirement from politics of the previous incumbent David Miliband, who had served as Foreign Secretary in the government of Gordon Brown. The local authority (South Tyneside Metropolitan Borough Council) is also controlled by Labour. The town has a local independent political party, the Progressive Party. This broadly centre-right party was formed in the 1950s to address hostility towards the Conservative Party. The Progressives have no representation beyond South Shields. The party controlled the old County Borough of South Shields council until 1974. South Shields is bounded by the A19 trunk road to the West and situated close to the Tyne Tunnel at Jarrow. The town is well connected to other areas of Tyne & Wear and to the strategic road network – the A194(M) motorway provides a direct link between the Borough and the A1/A1(M). The Tyne and Wear Metro light rail system was introduced in the 1980s and replaced British Rail services over the same route. The Metro network serves South Tyneside, Gateshead, Newcastle, North Tyneside, Sunderland and Newcastle Airport. The platform at South Shields Metro station is situated on a bridge directly above King Street – the town's main shopping area. When Metro services were introduced, the railway line at the former High Shields LNER station at Laygate was re-routed eastwards to the then-new Chichester Metro and bus interchange. The former South Shields LNER station was also closed and the Victorian buildings survived as a secondary entrance to the Metro station until they were demolished in 1998. As well as in South Shields town centre and in Chichester, there are other Metro stations at Tyne Dock, Simonside and Brockley Whins. Long-term plans by Nexus to re-open the former Sunderland to South Shields line between Tyne Dock, Brockley Whins and East Boldon would create a direct rail service between South Shields and Sunderland, without the need for passengers to change trains at Pelaw in Gateshead. Nexus also plans to open two new stations at Harton and Cleadon, raising the number of metro stations within the town from four to six. There are no railway stations within the town (stations operated by National Rail) or in the surrounding borough. There is a frequent pedestrian ferry service to North Shields on the opposite bank of the Tyne. The Shields Ferry carries tens of thousands of commuters and pleasure trippers each year. There has been a cross-river ferry service between the two towns since 1377. The Port of Tyne headquarters and international freight terminal are located at Tyne Dock in South Shields. The Port has a freight rail connection. Local bus routes are operated by Stagecoach North East and Go North East, which are planned to integrate with Metro services. There is a National Express coach service direct to London. The town's extensive network of strategic footpaths and cycle routes includes the Sea to Sea Cycle Route and National Cycle Route 1. ^ Morton, David (7 May 2014). "Remember When: Images that shed light on rich past of South Shields". The Chronicle. Retrieved 11 December 2018. ^ a b c d e "North East's role in the Civil War". shieldsgazette.com. southshieldsmuseum.org.uk. 9 January 2014. Retrieved 25 May 2015. ^ Eric Foner and John A. Garraty (2009). "ENGLISH CIVIL WARS". history.com. Houghton Mifflin Harcourt Publishing Company. Retrieved 9 December 2016. ^ Dodds, Derek (20 October 2005). Northumbia… (Battlefield Britain). England: Leo Cooper Ltd (20 Oct 2005). p. 139. ISBN 1844151492. ^ "Our History". Port of Tyne. Retrieved 11 December 2018. ^ Henderson, Tony (3 February 2015). "When war in the air came to the North East". The Journal. Retrieved 11 December 2018. ^ "Distance between South Shields, UK and London, UK (UK)". GlobeFeed.com. Retrieved 11 December 2018. ^ "Ten interesting facts about South Shields". Evening Chronicle. 1 January 2012. Retrieved 11 December 2018. ^ "Dame Catherine Cookson". Retrieved 22 December 2007. 4. Sir William Fox Hotel, Westoe village, South Shields. The village is a conservation area and was the setting for many of her books including Katie Mulholland and Kate Hannigan. ^ a b "South Shields Built-up area". NOMIS. Retrieved 11 December 2018. ^ "South Tyneside". UK Census Data. Retrieved 11 December 2018. ^ "The British Yemeni Society". Al-bab.com. Archived from the original on 21 July 2013. Retrieved 16 August 2013. ^ "The North East's Yemeni Race Riots". BBC News. Retrieved 16 August 2013. ^ Morris, Tim (1994). "Yemen Reviews". Archived from the original on 12 April 2000. Retrieved 11 December 2018. ^ "David Miliband MP – Maiden Speech to Parliament". Davidmiliband.info. Archived from the original on 28 July 2013. Retrieved 16 August 2013. ^ "Less Cookson, more Ali: Tyneside town finds hidden Muslim history". theguardian.com. Retrieved 21 February 2016. ^ "The King of South Shields". Archived from the original on 7 September 2008. Retrieved 11 December 2018. ^ "Plays". Peter Mortimer. 2 August 1930. Retrieved 16 August 2013. ^ Reed, Angela (8 August 2008). "MP backs moves to mark Muhammad Ali's South Shields visit". South Shields Gazette. Retrieved 16 August 2008. Ms Gharavi, from South Shields, creative director of Bridge + Tunnel Productions in Newcastle, said: "Mr Miliband's support for the plaque project is exciting and has brought momentum to the campaign. "I'm sure the people of South Shields will be glad to hear that it is another step closer to reality. ^ "British-Yemeni Society: From South Shields to Sheffield: A photographic journey". Al-bab.com. Archived from the original on 21 July 2013. Retrieved 16 August 2013. ^ "Inspector George Gently is back for four new single dramas for BBC One – Gently In The Blood". BBC News. 7 April 2009. Retrieved 13 January 2010. ^ "PICTURE SPECIAL: Exhibition marks collieries' closure". Shields Gazette. 15 May 2013. Retrieved 11 December 2018. ^ a b c "Version 5, Change in Claimant Count / Unemployment rate in the borough". southtyneside.info. 5 May 2008. Archived from the original on 14 May 2007. Retrieved 30 August 2008. ^ "CLAIMANTS, OCTOBER 2011". The Guardian. Retrieved 12 January 2012. ^ "Foreshore set for big revamp". South Shields Gazette. 13 March 2007. Retrieved 24 December 2007. ^ "Dunes Adventure Island". Dunesadventureisland.co.uk. Retrieved 4 June 2014. ^ a b "Ten interesting facts about South Shields". nechronicle. 1 January 2012. ^ "Tyne South Pier". The Lighthouse Directory. University of North Carolina at Chapel Hill. Retrieved 6 May 2016. ^ "Herd Groyne". The Lighthouse Directory. University of North Carolina at Chapel Hill. Retrieved 6 May 2016. ^ Historic England. "South Pier, South Shields (1436854)". National Heritage List for England. Retrieved 23 February 2019. ^ "Handbook of local landmarks". Archived from the original on 1 January 2015. ^ Jones, Robin (2014). Lighthouses of the North East Coast. Halsgrove. ^ Butcher, Joanne. "South Shields' Herd Groyne lighthouse is shipshape after facelift". The Journal. Retrieved 11 December 2018. ^ "Herd Groyne Lighthouse, River Tyne". Northumbrian Lighthouses. Retrieved 11 December 2018. ^ Pevsner, The Buildings of England – County Durham, 1953, 1983. ^ "South Tyneside council: building description". Southtyneside.info. Retrieved 16 August 2013. ^ Duffy, Martin. "South Tyneside magic festival". Retrieved 19 March 2013. ^ Reed, Angela (21 July 2008). "Planetarium's future saved – with move out of town!". South Shields Gazette. Retrieved 21 August 2008. THE future of South Tyneside College's planetarium and observatory has been secured – with a move outside the borough. ^ "College Info – Courses by Subject". South Tyneside College. 2008. Archived from the original on 21 August 2008. Retrieved 21 August 2008. ^ "ANY QUESTIONS?". South Shields Gazette. 9 February 2007. Retrieved 19 January 2008. ^ "Pupils' sad farewell as school closes". Shields Gazette. 18 July 2008. Retrieved 11 December 2018. ^ "AskOxford: Geordie". AskOxford.com. Archived from the original on 29 September 2007. Retrieved 13 October 2007. ^ "Not Only A Hero, An Illustrated Life of Simpson, the Man with the Donkey". Archived from the original on 17 December 2007. Retrieved 5 November 2007. ^ Mulholland, Jim (14 May 2015). "John Simpson Kirkpatrick: The Untold Story of the Gallipoli Hero's Early Life". Shields Gazette. ^ Guitarhoo (22 February 2006). "Actor John Woodvine collapses on stage". interview. ^ "Youngest person to circumnavigate the globe by motorcycle (male)". Guinness World Records. Retrieved 11 February 2018. ^ "From literature..." People. Visit South Tyneside. 24 March 1943. Retrieved 4 June 2014. ^ Emerson, June (18 September 2003). "Obituary: Jack Brymer". The Guardian. London. ^ Ford, Coreena (17 September 2011). "Actor Craig Conway settling back home in the North". nechronicle. ^ a b c Walsh, John (24 December 2011). "Sarah Millican: Gossip girl". The Independent. Londpn. Retrieved 4 June 2014. ^ "A housewife's lot, according to Dorfy". Shields Gazette. 22 July 2009. Retrieved 11 December 2018. ^ "Professor John Erickson". The Independent. London. 12 February 2002. Retrieved 11 September 2011. ^ "How Ginger Wildheart's shoestring album beat Rihanna". London Evening Standard. ^ "Philosopher John Gray: We are not facing our problems". The Independent. London. 11 April 2009. Retrieved 11 September 2011. ^ Henderson, Tony (10 September 2014). "North East's industrial past celebrated as part of heritage open days". The Chronicle. ^ "Eric Idle Biography". Flmreference.com. Retrieved 11 September 2011. ^ Lester, Paul (27 February 2013). "New band of the day: Lulu James (No 1,461)". The Guardian. London. ^ "South Shields tribute to Aussie war hero John Kirkpatrick". Shields Gazette. Retrieved 4 June 2014. ^ Kinghorn, Kristie (26 November 2009). "Joe McElderry's got the X Factor". BBC Tyne. Retrieved 11 December 2018. ^ "Sarah Millican". Who Do You Think You Are Magazine. 11 September 2013. Retrieved 4 June 2014. ^ "About Robert Olley". Robert-olley.myshopify.com. Retrieved 4 June 2014. ^ "Honorary Degree for David Phillips CBE – Durham University". Durham University. ^ "Chris Ramsey's Newcastle – in pictures". The Guardian. London. 4 February 2013. ^ "Dame Flora Robson (British actress) – Encyclopædia Britannica". Encyclopædia Britannica. Retrieved 4 June 2014. ^ Hodgson, Barbara (26 June 2013). "Soprano Claire Rutter visits Newcastle". The Journal. Retrieved 11 December 2018. ^ "Director Ridley Scott quizzed". BBC News. 26 March 2001. Retrieved 16 August 2013. ^ "Sir Frank Williams – Formula 1". VisitSouthShields.com. 8 December 2009. Archived from the original on 23 March 2012. Retrieved 11 September 2011. ^ Alastair, Craig (13 May 2012). "Actor John Woodvine collapses on stage". The Chronicle. ^ "Jan. 30, 1790: The Lifeboat, an Idea Whose Time Has Come". WIRED. ^ "Home page". South Shields RFC. Retrieved 11 December 2018. ^ "Westoe RFC". Official site. Westoe RFC. Archived from the original on 14 September 2008. Retrieved 8 September 2008. ^ a b "Westoe RFC History". Official site. Westoe RFC. Archived from the original on 3 March 2009. Retrieved 8 September 2008. ^ "Westoe grit wipes staines clean away". South Shields Gazette. 7 March 2005. Retrieved 24 October 2007. ^ "2015 Polling Guide – South Shields". UK Polling Report. Retrieved 16 August 2013. ^ "South Shields – David Miliband – Official website". Davidmiliband.net. 23 March 2013. Retrieved 16 August 2013. ^ "2005 General Election results – South Shields". The Guardian. London. Archived from the original on 26 May 2007. Retrieved 16 August 2013. ^ "Ferry gets first woman boss in 700 years". Shields Gazette. Johnston Press. 12 August 2008. Retrieved 16 August 2008. There has been a ferry service between North Shields and South Shields since 1377. ^ "Climate Summary for South Shields". Weatherbase.com. Retrieved 16 August 2013. ^ "South Shields, England". Weatherbase.com. 2013. Retrieved 11 July 2013. Wikimedia Commons has media related to South Shields. Wikivoyage has a travel guide for South Shields.